NOTE: While every care has been taken in preparing the results the possibility of inadvertent error can not be ruled out. The ‘Sashastra Seema Bal’ does not undertake responsibility for such error and reserve the right to rectify the same later on. Sashastra Seema Bal SSB as recently Started the Recruitment of 872 Posts of Sub Inspector, Assistant Sub Inspector & Head Constable (Communication). Many Interested Candidates filled there Application Form. The Process of Submitting Application Form is Conducted Offline. The Process of Submitting the Application form was the Last Date 30 days from the date of publication of this advertisement in the Employment News. Here the Candidates Can Check the Detailed Recruitment from the Below Provided Link. All those Candidates who Filled the Online Application form for the Above Vacant Posts gave there Exam Successfully. The PET/PST Exam Was Conducted on 14 To 26 May, 2018. The Exam Was Firstly Stage Conducted PST/PET. Successful Candidates Was Called for the Written Exam. The written test was multiple choice objective type. There was two question papers carrying 100 questions each. Time duration for was 02:00 hours (120 minutes) for each paper. Final merit list for the posts of will be prepared on the basis of marks obtained in the Paper-II (Technical Written Examination) only. More Details about Exam is Provided Below. All the Candidates Who gave the PET/PST Exam are Now Waiting for there Exam Result. Soon the SSB Will declare them on his Official website So all those Candidates who is waiting for the Result and Started searching about it are advised to have some Patience. Candidates be in touch with the SSB websites so that they will got the latest Updates about result and other related Information. Here we are also sharing the direct Link to Download the Result So the Candidates Directly got there Result. The final selection will be made on the basis of this Merit, Category Wise, after completion of Review Medical Examination. Some candidates must have confusion for SSB SI ASI HC Result. They can share or ask their queries through the comment area provided at below. Latest Updated On 27.03.2019 : The Documentation Will Be Conducted During Medical Examination Instead Of During PET & PST Stage For Posts Of SI/Staff Nurse, ASI (OTT, Pharma, Dental Tech, Radiographer, Stenographer) & HC/Ministerial………….Download The Official Notice Through The Link Given Below…………..
Sashastra Seema Bal (SSB) has recently announced about the recruitment of 181 Posts of Head Constable, Sub Inspector (Staff Nurse Female) & Assistant Sub Inspector. Many Eligible Candidates Filled there the application form for these Posts. The Application Form is Submitted Online. The Conducted Till date 09.09.2018. More Details about the recruitment is provided below. As per the method of selection, Physical Efficiency Test will be conducted at first stage for these posts. PET/ PST was scheduled in the Month of January for SI, ASI & HC. The Written Exam Will be Conductd in upcoming dates. More Details about the Exam is provided below. Candidate should know that Admit Card is mandatory for the written Exam. Without Admit Card any candidate who want to enter in the exam hall can not get permission to participate in the written exam. Admit Card is available on the website of SSB before the exam date. No Hard copy of the Call Letter/Hall Ticket will be sent by post. Candidate will have to download their Admit Card before exam date. The Exam will be of Two Question paper carrying 100 questions each. Candidates are advised to stay tuned with this page and website of Sashastra Seema Bal (SSB) for more updates bookmark our website (www.Jobriya.in) by pressing Ctrl+D for getting all new updates. Latest Updated on 18.04.2019 :- BSF has Released 1072 Posts Radio Operator & Mechanic Recruitment Pdf…..The Online Application Will Start From 14 May 2019 Till 12 June 2019……….Get All the Necessary Info. Given Below………. Applications are invited from Male & Female Indian citizens belonging to General Schedule Castes, Scheduled Tribes and other backward classes for the post of HC (RM) and HC (RO) in Border Security Force (BSF). Matriculation Or Equivalent From a Recognized board & Two Years Industrial Training Institute Certificate (ITI) In Radio & Television Or General Electronics, Or Computer Operator & Programming Assistant Or Data Preparation & Computer Software Or General Electronics OR Data Entry Operator From a Recognized Institute. Pass In Intermediate Or 12th Standard Or Equivalent With Physics, Chemistry & Mathematics From A Recognized Board Or University Or Institution as A Regular With Aggregate 60% Marks In PCM Subjects. Matriculation Or Equivalent From a Recognized board & Two Years Industrial Training Institute Certificate (ITI) In Radio & Television Or General Electronics, Or Computer Operator & Programming Assistant Or Data Preparation & Computer Software Or Electrician Or Fitter Or Info. Technology & Electronics System Maintenance or Comn Equipment Maintenance or Computer Hardware Or Network Technician or Mechatronics or Data Entry Operator From a Recognized Institute. However the SC/ST, Female Candidates Of All Categories & BSF serving personnel and female candidates of all categories are not required to submit examination fee. There will be a composite paper carrying 100 questions of 200 marks. The duration of test will be 03:00 hours (180 minutes). Each question shall carry 02 marks and 0.50 marks will be deducted for each wrong answer. Note: However, number of candidates to qualify in OMR Based screening test and further to appear in the next phase shall be restricted to 20 times the number of vacancies for recruitment post. Any other documents/ certificate/ testimonials that the candidate wishes to produce. A Descriptive Paper of Maximum 150 Marks Covering Physics, Chemistry, Maths, Logical Reasoning & English (12th Standard). Max- Time- 2 Hrs 30 Minutes. Dictation test (in English writing) of minimum 100 words – 50 Marks. Note: Qualifying marks for the dictation test will be 38% & for General/OBC and 33% for SC/ST candidates. Both above Descriptive Tests will be Mandatory and the final merit will be prepared on the marks obtained in these tests. 2.5 Marks will be Deducted for each admission/mistake of single letter. 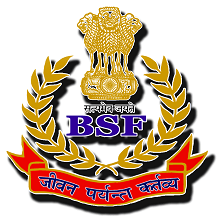 How to Apply Candidates Will have To Apply the Application Form using BSF Recruitment Portal. Above Portal Will Become Active On BSF Website With The Link http://recruitment.bsf.gov.in/ During the Following Duration For Submission From 14 May 2019 to 12 June 2019. Latest Updated On 24.04.2019 : CRPF Hindi Translator Inspector, Female Trained Teacher Recruitment Is Started…….Download the Detailed Notification & Apply Through The Link Given Below,…..
Good News Candidates | CRPF is Going To Start The Recruitment of 21,000 Constable Very Soon………The Recruitment Will Start Soon…………Get the Detailed Information Through The Image Given Below……..
About CRPF :- The CRPF is one of the oldest and most experienced Armed Police Force of the country. The demand of this Force from States and Union Territories has substantially increased and this Force has been called upon to help the States in almost every situation. The role of the Force and services rendered by it have extended beyond the nation’s borders as well. Over the years CRPF has also produced number of outstanding sportsmen and athletics who have brought honour and appreciation both with in and outside the country. JOB NOTE:- CRPF make Recruitment for Various Post for Constable, General Duty, Ministerial, Non ministerial, Head Constable Tradesman jobs & Post for Group B & C. CRPF also conduct Recruitment for Engineering & Medical Jobs. All CRPF Aspirants are advised to keep in touch with official website (http://crpf.gov.in) & as well as through this Page. Dear CRPF Aspirants, When any Recruitment Notification will issue or CRPF conducts any Recruitment Process, we will provide Information Regarding that Recruitment from the below given Table. We will update the Table & New Recruitment will show Soon …. For all updates regarding CRPF Recruitment & Further Process, Keep in touch with our Leading Job Portal (www.jobriya.com). You can Bookmark our site also to get latest Updates.